At Smile Cliniq you can take advantage of a service in which we place mini implants to replace small teeth or to secure a loose denture, they can even be used for anchorage for orthodontic treatments. What Does a Mini Dental Implant Look Like? Mini implants are ultra-small diameter, bio-compatible titanium alloy implant screws that are as strong as a normal sized conventional implant. 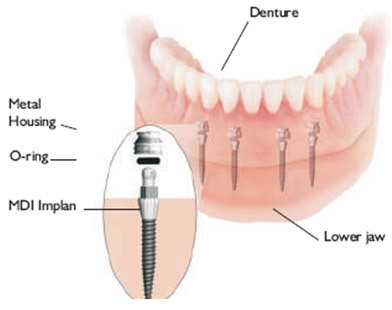 It takes the form of a slim titanium screw with a retaining fixture that can be incorporated into a denture. The retaining fixture (meta housing) contains a rubber ‘O-ring’ that acts like a socket. This ‘O-ring’ holds a denture in place by snapping over the ball on the top of the implant. This enables the denture to rest easily but securely on top of the gum tissue. Who Would Choose a Mini Dental Implant? Patients with loose dentures, or with small gaps or for those whom conventional implants are not suitable. Also patients undergoing orthodontic treatment, who do not want to have extra oral anchorage (headgear). Yes, with very high long term success rates. What Is The Procedure For A Loose Denture Solution? The procedure is quicker than that for a normal dental implant. Due to their size, they cause little or no discomfort and are placed gently in the jawbone. Your dentist will administer a local anaesthetic to start with. He will drill a small hole in the jawbone to create a space for the placement of the dental implant. If we are using the mini dental implants to secure a denture, then the denture will be marked at a series of ‘points’ to show the position of the implants. Each of these points will have a metal attachment added which anchors the denture to the implant. This process usually takes around an hour. Mini dental implants costs vary according to individual cases but this type of implant costs much less than the normal size. Costs will be in the region of £1400. Please see here for our fees guide. What Are The Benefits Of A Mini Implant? The benefits include, more secure dentures and less likelihood of them falling out. Other benefits include an better comfort and being able to eat a wide variety of foods more confidently. They are also very good for restoring small gaps, where a conventional implant is too big.